Shanahan Swaffield Partners (SSP) has a finance and insurance sector, InsureRight. At InsureRight we offer a large range of services, designed to cater to every aspect of your insurance & finance needs. Shanahan Swaffield Partners are dedicated to protecting you and your business and helping grow your assets. From general insurance to asset purchase Gordon Dallow can help you to insure your assets. Our finance and insurance sector, InsureRight, offers a large range of services designed to cater to every aspect of your finance and insurance needs. Our finance services can help you grow your assets, cover customer loans, and secure equipment leases. From general insurance, public liability, loan protection to life insurance and income protection, we’ve got you covered. For all your finance and insurance needs, contact our SSP specialist advisors today. 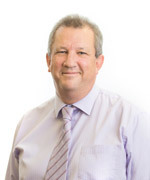 Gordon brings to our organisation 15 years experience in insurance and finance risk management within the Rockhampton Motor Vehicle Industry. Prior to that, Gordon spent twelve years working for TAA/Qantas in various locations and areas including management. His background includes growing up in Mount Isa, schooling in Charters towers and working for Mount Isa Mines. Gordon’s motto in business is ‘Exceed your Clients Expectations’.